Address: Oldenburger Ring 3 02829 Markersdorf Germany. 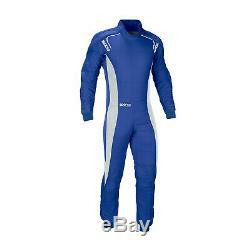 SPARCO ERGO RS-3 blue Race Suit (FIA homologation). The Sparco Ergo RS-3 is a 2 layer race suit which has been developed as a result of studying the driver position in a race car with seat belts fastened. This research has allowed Sparco to make a suit which avoids excess material in areas where the harness belts are in contact. The result is a race suit which does away with the traditional zip closure. Instead there are two zips, one on each shoulder, leaving a cleaner for sponsor logos. The Ergo RS-3 race suit is manufactured using a mix of fabrics made from natural fibres to increase comfort and breathability. Strategically placed stretch panels improve comfort further still. We have security measures in place to attempt to protect against the loss, misuse and alteration of personal information under our control. The listing is automatically managed by IdoSell Shop , a system that takes extra care of listing only products that are actually in stock. The item "New SPARCO ERGO RS-3 blue Race Suit (FIA homologation) 50" is in sale since Friday, March 1, 2019. This item is in the category "Sports Mem, Cards & Fan Shop\Fan Apparel & Souvenirs\Racing-Other". The seller is "topracingshop_com" and is located in Markersdorf. This item can be shipped worldwide.